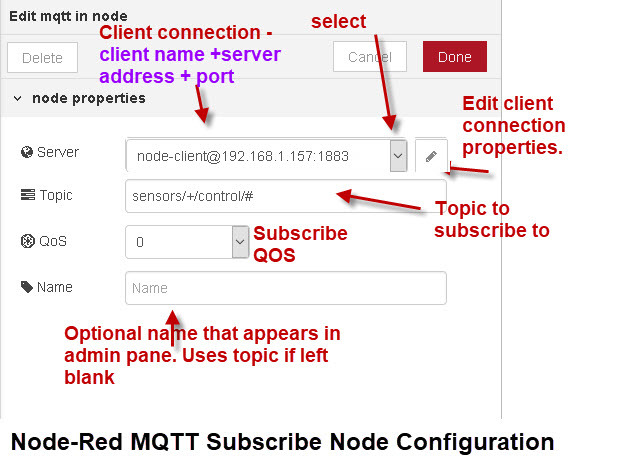 Node-Red provides both an MQTT subscribe (input) and publish (output) node. The configuration for these nodes are almost Identical as the main part of the configuration concerns the actual client connection. 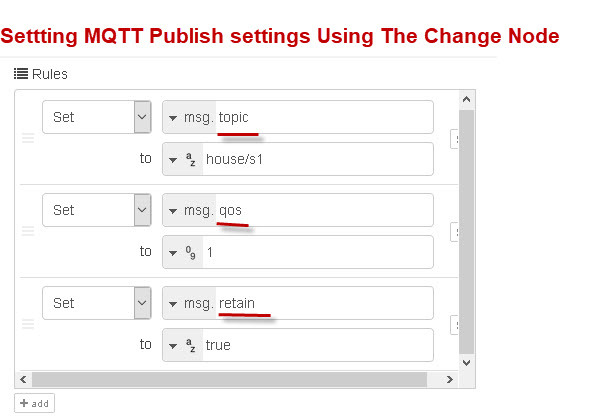 Before we look a the actual configuration we will look at MQTT client connections in general. Connecting to an MQTT Broker or Server. To connect to an MQTT broker or server you need to know the Broker IP address or name, and the port that it is using (default 1883). In addition a client needs to provide a client name to identify itself. Each client connection requires a unique client name. A single client connection can be used to both publish and subscribe. An MQTT broker can enforce encryption and username/password authentication in which case the connecting client must comply. 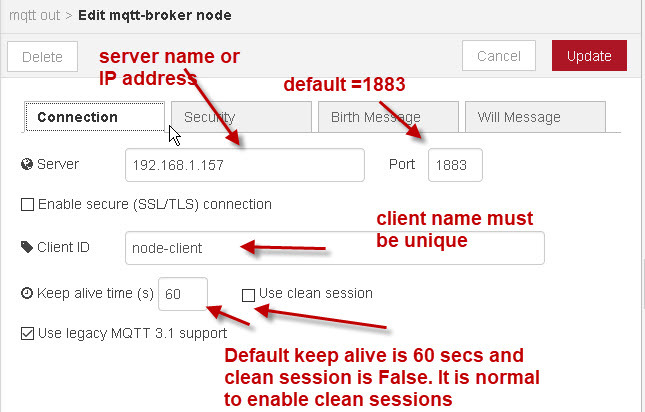 MQTT clients will usually by default establish a clean session with a broker. A clean session is one in which the broker isn’t expected to remember anything about the client when it disconnects. With a non clean session the broker will remember client subscriptions and may hold undelivered messages for the client. This is a mechanism used to determine if a connection is still present. The default interval is 60 seconds. The idea of the last will message is to notify a subscriber that the publisher is unavailable due to network outage. The last will message is set by the publishing client on a topic and is stored on the broker. It Is sent to subscribers if the publisher disconnects abnormally. If the publisher disconnects normally the last Will Message is not sent. The retain Flag is normally set to False which means that the broker doesn’t keep the message. If you set the retain flag to True then the last message received by the broker with the retained flag set will be kept. The QOS of the published message has no effect on the retained message. However the publish topic and QOS settings in the publish node are applicable only to the publish node. 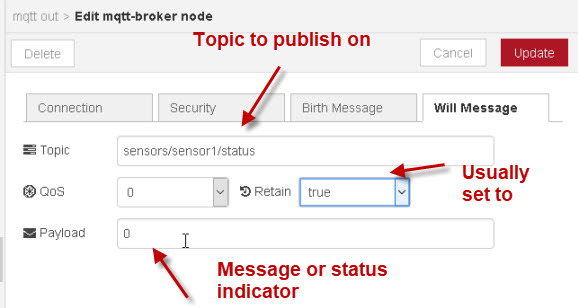 To publish a Message to an MQTT broker you use the MQTT publish node. To use a publish node drag the node from the node palette on the left into the main workspace. The main setting is the broker or server setting. 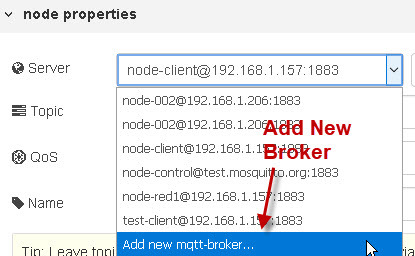 You can select a previously configured server which you can edit by clicking on the edit button, or add a new broker by selecting the add new mqtt server option from the server list. The server name that appears in the server list is a combination of the client ID and Broker name or IP address. 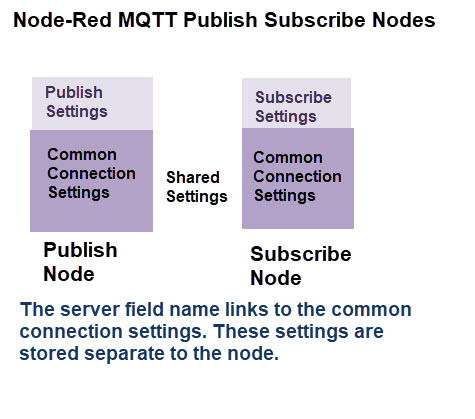 Note: The MQTT specification originally used the term broker but it has now been changed to server. 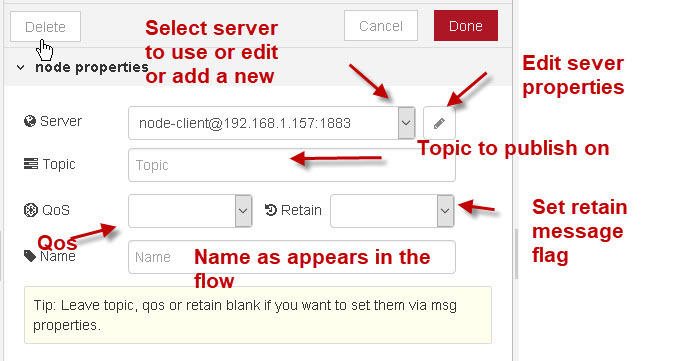 You can also configure the topic address,the QOS for the message and the retain flag. If you click on the edit icon to the right of the server you can edit the server settings. The server settings has 4 tabs. The port defaults to 1883 which is the standard MQTT port. You can use either the IP address or FQDN for the server address. The client name needs to be unique on the broker. See client names and duplicate client ids. The default keep alive is 60 secs and clean session is False. It is normal to enable clean sessions. This lets you configure a use a username and password for the connection. Whether you need a username/password for the connection is determined by the MQTT broker. The birth message is published by the client when the MQTT node starts. The Will message is part f the MQTT specification and is stored on the broker and sent in the advent of a failed client connection. The message payload will either be a message to indicate the connection has failed or a status indicator. The retained message will usually be set so that new clients know the status. The client supports SSL encryption between the client and server as well as using certificate based authentication. 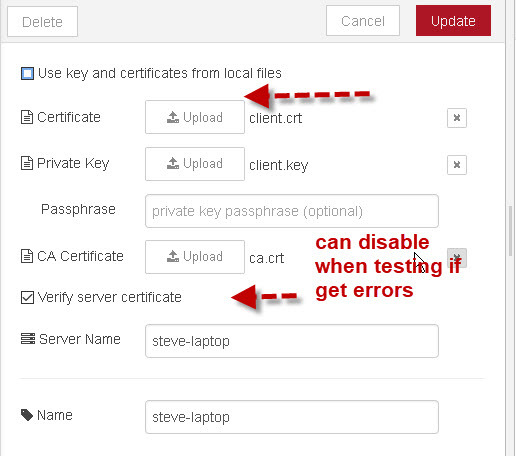 and add the CA certificate to node-red by uploading it. In the screen shot below I used the same self generated certificate as I used on Mosquitto broker. 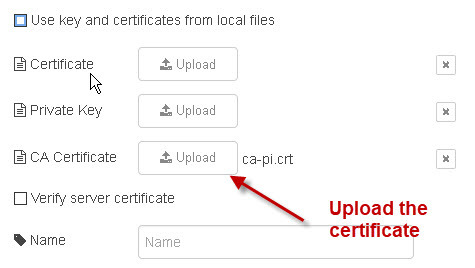 If the CA file is on your local computer you can use it by enabling the use key and certificates from local files option. as shown below and entering the path and file name:Alternatively you can upload the files using the upload buttons. Note: the verify server certificate checks the the name on the certificate is correct as should be enable on live systems. Leaving it un-checked is like using the -insecure option of the mosquitto_pub /_sub tool. Entering a name in the box doesn’t seem to make any difference. If you are using a public broker like cloudmqtt then you will need to use a public CA. 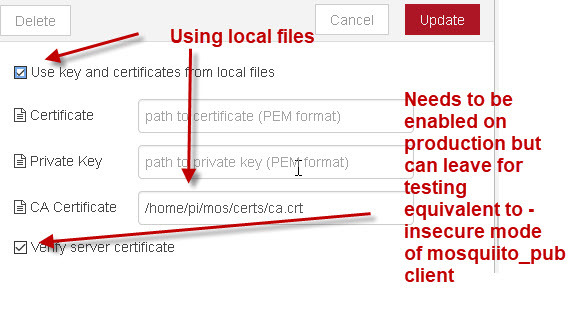 You will need to get a copy of ca-certificates.crt or ca-certificates.pem file. This file contains a list of trusted CA certificates and is available from Mozilla. If you are using Linux it is usually in /etc/SSL/certs, but you can download it for the curl site here. When a client subscribes to a broker it needs to provide a topic and QOS. The subscribe node has no unique settings. However again the the topic and QOS settings apply only to the subscribe node and they need to be configured in the node as it doesn’t accept an input from other nodes. To use a subscribe node drag the node from the node palette on the left into the main workspace. Double click on the node to configure it. The main configuration screen is shown below, and is almost identical to the publish node. Note: You don’t currently appear to be able to subscribe to multiple topics using the same node. If 2 or more nodes anywhere in the Workspace use the same connection name e.g. node-client@192.168.1.157:1883 and another node or nodes (publish or subscribe) use that connection name. Then changes to the connection properties e.g port number,clean sessions etc will affect all of the nodes using that connection name. What do you do is a topic publishes the same value all the time. What’s the easiest way in node-red of subscribing to that topic, but only doing something when that topic payload changes. I do this with the topic logger which you can download form the site. The trick is to store the last payload in a context,flow or global variable so that you can compare the last value to the current value. However, I believe the port should be 8883 for TLS.